Raymond Ferguson, 55, died June 18. Homeless, he would sleep on the Blue Line, near the federal buildings downtown, and occasionally a friend’s home. Most of Raymond’s days were spent at the corner of State and Randolph, where he became a beloved figure. After he died, people left flowers at a makeshift memorial. “When you passed that corner, you were entering Raymond’s world… and the atmosphere of that world consisted of kindness, love, positivity and selflessness,” one man told Block Club Chicago. Raymond Ferguson is among dozens of Chicagoans who died this year while coping with homelessness. 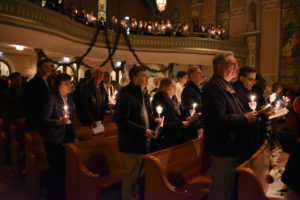 They were remembered at a Dec. 18 Homeless Memorial service, an interfaith candlelight vigil at Old St. Patrick’s Church, 700 W. Adams. Together with Old St. Pat’s and three homeless service organizations, CCH co-leads a yearly service held since 2010 to remember people who died while coping with homelessness. During the service, the lives of 46 homeless Chicagoans were remembered by those who knew and cared for them. Director of Organizing Wayne Richard and Maxica Williams, a mother of four and homeless leader at CCH, offered reflections during the service. “The effects of homelessness are serious — isolation, nowhere to go, loss of dignity, despair, entrapment, and many more barriers… We need you to keep fighting with us, to keep showing compassion to all walks of life,” Ms. Williams said. “Silent tonight are the wishes and dreams of the brothers and sisters who have gone on home,” said Mr. Richard, sharing a poem he wrote for the service. Based on most recent census data, 80,384 Chicagoans experienced homelessness in 2016, per a CCH analysis. Eighty percent lived doubled-up in the homes of others, often in overcrowded conditions. Our city’s homeless included 35,435 children and adults living in families. Nationally, over the course of a year, 2.5 million to 3.5 million people experience homelessness. The service is affiliated with National Homeless Persons’ Memorial Day, an event organized by the National Coalition for the Homeless. Homeless people are hosted at a dinner prior to the service. Ignatian Spirituality Project works to end homelessness by providing Ignatian retreats to men and women who are homeless and in recovery. Harmony, Hope & Healing’s creative, therapeutic and educational music programs offer emotional and spiritual support to homeless and underserved women, men and children in the Chicago area. Franciscan Outreach provides comprehensive services to those who are homeless, including healthy meals, warm beds, and case management services to 8,000 individuals annually. Old St. Patrick’s Church extends hospitality to all that find the church on their path, and to serve the life and work of the laity in the world. Chicago Coalition for the Homeless organizes and advocates to prevent and end homelessness, based on the belief that housing is a human right in a just society.